The ability to process role approvals in either serial or quorum mode. The retrieval of approver DNs from the role object (nrfRequest). If you create a custom workflow, the approvers must be defined in the workflow; however, this might lead to addressee evaluation problems and less security concerning who can approve a role. The ability to display the role using localized display names. All nrfRequest object mappings for request and approval forms. Read-only display of request information. 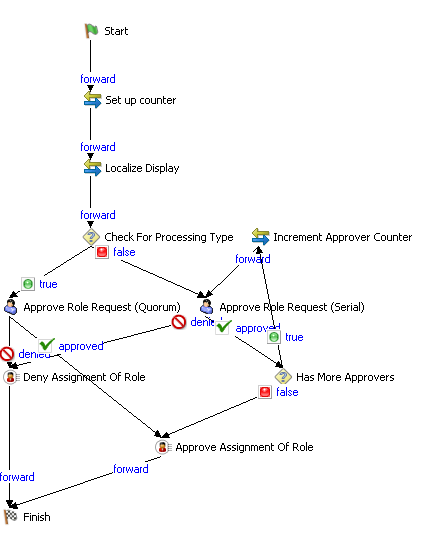 The role approval workflow does not allow changes to the request. Approvers have only the ability to approve or deny the role request. An e-mail notification is sent to all approvers of role approval workflows. 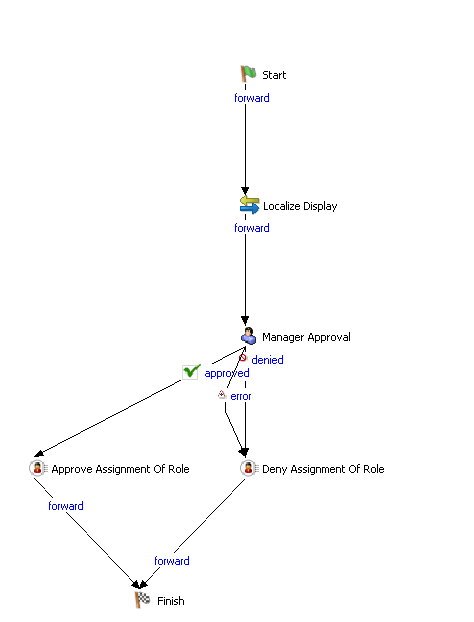 A completed notification e-mail is sent upon completion of the role approval workflow. The recipient e-mail address is used when the workflow is intended to be assigned to a user identity. This pattern is shown in Figure 6-6. The components of this workflow, and their responsibilities are summarized in Table 6-9. Logical starting point for all workflows. For role approvals it must instantiate the nrfRequest object. Sets up the counter for the number of approvers in case the mode is Serial. Sets up the display labels for each of the associated display names for the user’s locale. If the quorum condition exists, control proceeds to the Approve Role Request (Quorum). If the quorum condition does not exist, control proceeds to the Approve Role Request (Serial). You specify the processing type for the role approval when you set up the Roles Catalog. This is where the decision to approve or deny the request is recorded as part of the workflow instance. The quorum condition required to make the process successful is retrieved from the nrfQuorum attribute of the nrfRequest object. This is where the decision to approve or deny the request is recorded as part of the data flow associated with the workflow instance. Changes the deny attribute in the nrfRequest object to true. Changes the approve attribute in the nrfRequest object to true. Logical end point of all workflows. To use the standard Role Approval workflow in your user application, you must specify your own users as Trustees. For information on setting the Trustees property, see Section 4.2.6, Modifying Settings of a Provisioning Request Definition. One Role Binding activity must be set to approved and the other set to denied. You must link each of the Role Binding activities to the Finish activity. If the workflow does not meet this requirement, it is invalid, and Designer prevents you from deploying it. The Role Service driver needs these values to set the status for the workflow and to then apply the logic to associate the role to the identity. Instantiate the nrfRequestDN in the Pre Activity Data Item Mapping. Because Designer and the User Application user interface do not allow entry of approvers for custom role approval workflows, you must specify the approvers in the workflow itself. Therefore, if you create a custom workflow based on a copy of the Role Approval or SoD Conflict Approval provisioning request definitions, you must remove the ECMA methods from Data Item Mapping or Properties definitions. In the following example, a user requests a role and the user’s manager approves it. The components of this workflow, and their responsibilities are summarized in Table 6-10. Logical starting point of all workflows. Sets up the display labels for the user’s locale. This is where the decision to approve or deny the request is recorded as part of the workflow instance. The role request approval is needed only by the requestor’s manager. The ability to process SoD conflicts in either serial or quorum mode. The retrieval of SoD approver DNs from the request object (nrfRequest). If you create a custom workflow, the approvers must be defined in the workflow; however, this might lead to addressee evaluation problems and less security concerning who can approve an SoD. The ability to display the SoD using localized display names. Read-only display of requests. Approvers can only approve or deny the SoD conflict. An e-mail notification is sent to all approvers per SoD conflict found for SoD workflow approvals. 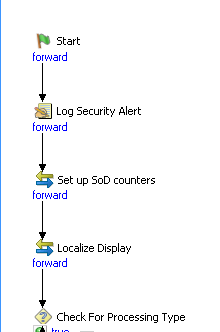 A completed notification e-mail is sent upon completion of the SoD approval workflow. The recipient e-mail address is used when the workflow is intended to be assigned to a user identity. The roles subsystem allows one Separation of Duties approval flow for the Role subsystem. If you choose to use a custom SoD approval flow, make sure that it works for all SoD situations. Sets up the display labels for each of the associated Display Names for the user’s locale for the SoD conflicting Role. Sets up the display labels for each of the associated Display Names for the user’s locale for the SoD conflcting Role. If the quorum condition exists, control proceeds to the Approve SoD Conflict (Quorum). If the quorum condition does not exist, control proceeds to the Approve SoD Conflict (Serial). Loops through the SoD requests. 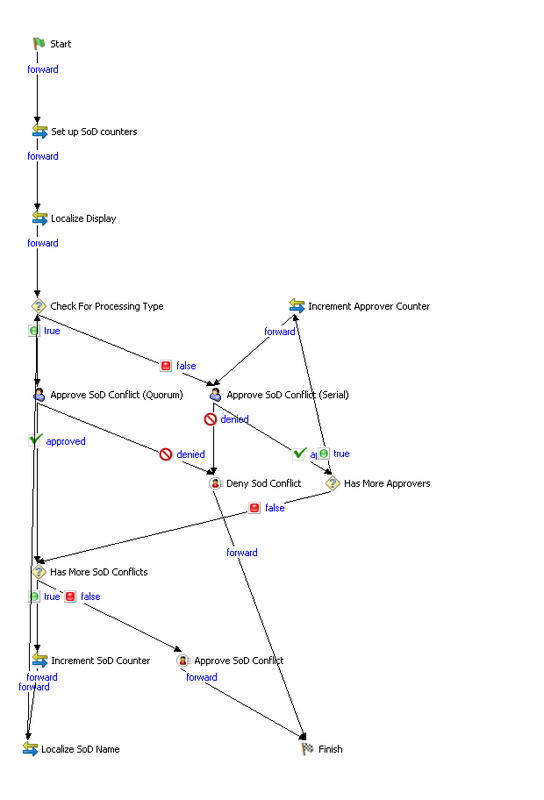 Separation of Duties conflict approval workflows are complex. Therefore, it is not recommended that you write a custom version. Rather, it is recommended that you add new activities to a copy of the standard SoD approval workflow. For example, you might want to add additional logging or messages. This example illustrates a customized workflow that includes a new logging activity. The Log Activity properties are shown in Figure 6-10. SoD Conflict approval workflows must follow the same rules as the role approval workflows as described on Section 6.6.2, Writing Custom Role Workflows.